The band’s self-titled, self-released 2008 album does not do them justice, making them sound like a Wolf Parade Jr. Live, Parlovr are way more energetic, fun and melodic — though it may have also had something to do with a fair amount of new material in their set. Singers Louis Jackson and Alex Cooper semi face each other from opposite sides of the stage rocking back and forth like manic Drinking Birds, flipping their ’90s skate rat hair around, while mountain man drummer Jeremy MacCuish holds down the beat. They clearly enjoy playing, and it’s a lot of fun to watch too. Be sure to watch Parlovr’s two new Takeaway shows which are at the bottom of this post. One of them features an unexpected run-in with a Montreal councilman, the outcome of which probably wouldn’t happen in NYC. 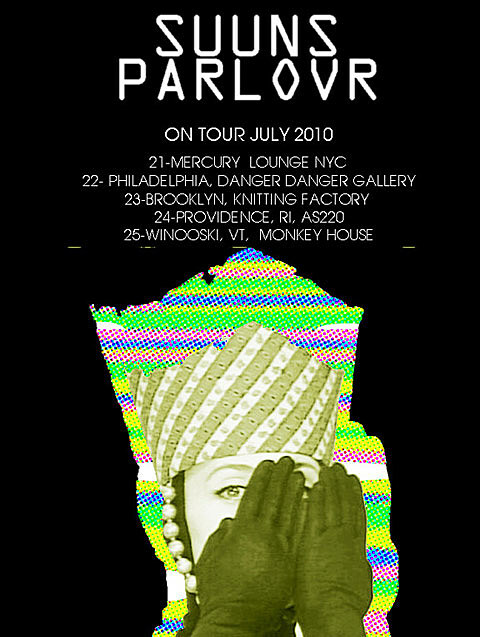 After their U.S. jaunt, Parlovr will head back to Montreal, where they’ll play a free warm-up party for the Osheaga Festival on July 29 at Cafe Campus that is being sponsored by Brooklyn Vegan, M for Montreal, Canadian music mag Exclaim and Blue Skies Turn Black. The 2010 Osheaga Festival is July 31 and August 1, with Arcade Fire, Weezer, Pavement, The National and Metric among the bands playing. 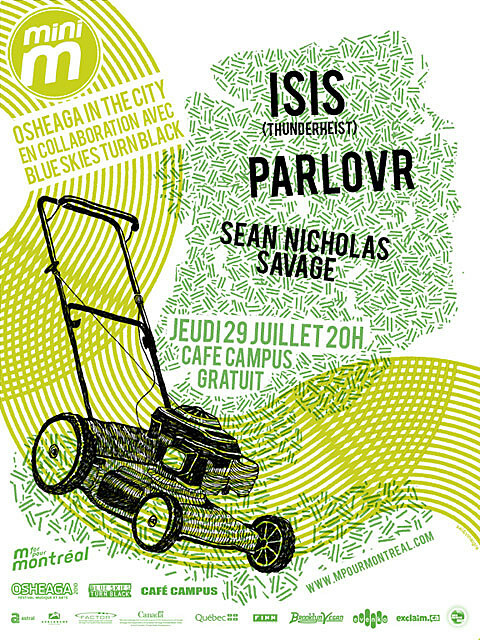 The BV/M4M show is one of a few “Osheaga in the City” events leading up to the big Festival weekend and also features Isis of Thunderheist and Sean Nicholas Savage. 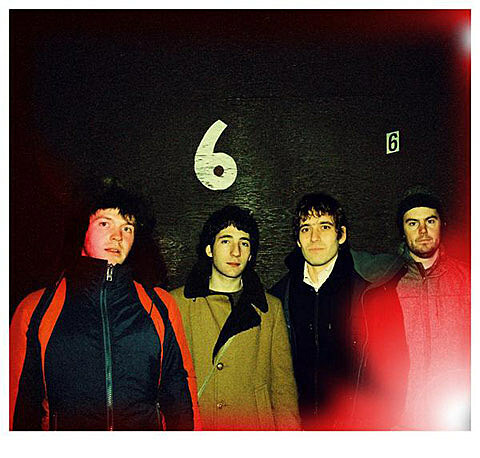 Meanwhile, Suuns will continue on in the U.S. after their dates with Parlovr. The band, who until just a couple month ago were known as Zeroes, will hit the road, opening for some of the dates on Land of Talk’s fall tour. (Their portion of the tour will end before Land of Talk plays Bowery on November 6 though.) The band’s EP, Zeroes, is quite good, sounding a little bit like Clinic — dark and claustrophobic but also capable of going epic, as on “Arena” which you can download at the top of this post. This will be a good double-bill. 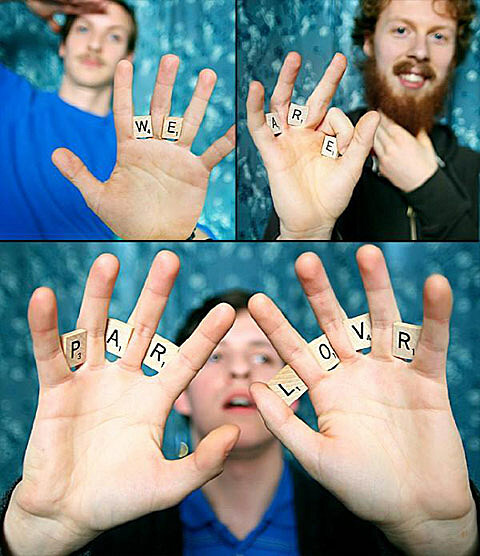 Those two Parlovr takeaway shows, flyers and tour dates for both Parlovr and Suuns are after the jump.